Look no further for the ultimate in precision and style with XADA抯 Piston shift knob. The Piston gives your interior a feeling of muscle only fit of a Mustang. CNC machined from billet aluminum and then anodized silver to match factory aluminum finishes, the Piston will deliver unparalleled quality and class to your interior cabin. Plus, the Piston is ergonomically styled for a comfort fit that will make rowing through the gears a more rewarding experience. Forget the valve reliefs, the XADA Racing Logo machined on the top face of the piston adds much more class. 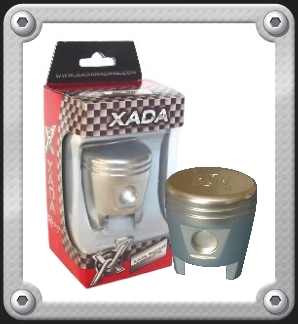 All XADA shift knobs include CNC machined plastic adapters to provide OEM quality fit and finish for � to � Mustangs. �+ adapters are designed to integrate seamlessly with shifter boot and shift knob. XADA strives to provide brilliant finishes, unique designs, and exact tolerances that will define the new standard of value and quality.